Click for background Deutsch Volksmusik (German folk music). You laugh? It may tickle the lederhosen off a real German, but this is the best German Festival in the U. S. of A., that I have ever attended. 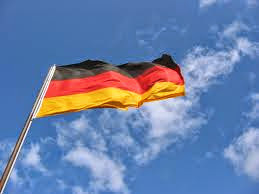 My Mother was German and I have been to a few German Festivals, some mislabeled Oktoberfest -- more on that later. All German-fests have sausages, potatoes, cabbages, pretzels, beers, singing, Alpenhorns, and yodeling. Roberts Cove has theirs amid the white marble graves of original settlers decorated with colorful German flags. And the Bratwurst -- in Germany and die Nordstaaten (the Northern States) Bratwurst is a mild veal sausage with a strong hint of nutmeg -- in Louisiana it is hot and spicy as die neue Schulemarm (the new School-marm). Technically speaking in all tongues, Roberts Cove throws a German Fest not an Oktoberfest. Because it is held only on the first weekend in October. As we all know Germans are sticklers for order. And in Germany, Oktoberfest begins late in September, on a date that moves with the moon, and runs through the first Sunday in October. Go figure! If Oktoberfest ends before October 3 (German Unity Day) it is extended to include it. "Sort of a German Leapfest," L. A. Norma told our seatmates on the train from New Orleans. German Immigrants were few in French Louisiana, but those who came left their mark on Pelican State history (Pelican Staat Geschichte). Notably there were the Germans said to have fed the indolent city folk of New Orleans from productive farms on the "German Coast," along Bayou Des Allemonds (French for Bayou of the Germans), 34-miles (54 kilometers) west of Big Swamp City. 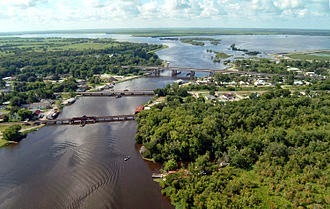 Amtrak crosses this bayou today but no longer stops at the settlement named Des Allemonds. One day, coming back from New Orleans on the train, we were treated to three Des Allemonds' boys fishing along the Bayou, dropping their drawers at our approach, and mooning the Los Angeles bound Sunset Limited. Roberts Cove is a prosperous rice-growing settlement near Lafayette, Acadiana's "Hub City," and where we left the train that saw the racially integrated naked rear ends. "Do you speak German?" asked a women introducing herself at the Festival. Her English was tinged with the local Cajun accent, but she was German, she said. Her accent oddity owes itself to the fact that late-arrival Germans learned their English from earlier-arrival French-Canadians, the much revered Cajuns. About whom detractors say, "They speak neither English nor French." They taught these German-Americans to speak their English with a French-Louisiana accent. We were inside the Song Fest Tent, singing, yodeling and listening to Alpenhorns. "Bisschen Deutsch," I answered. She understood "Deutsch," but not "Bisschen". "A little," I explained, I speak a little German. We raised our "Bier" and joined in the Rucksack Song (Rucksacksong). Her husband wore nice lederhosen and sang with such gusto I would bet money he had been a Boy-scout and sang these same songs with the same gusto then. Near Roberts Cove is Hawk's, a crayfish cafe' noted for purging their "mud bugs." Hawk's also prides itself on no signage. Finding it is something of a local game. Outsiders are a double muddled source of entertainment. One day, washing up at the dining-room wash basins, I asked a man where he was from. The man said, "Down the road." "No," he said, "further down the road."